Even though MS-Access creates a Form on ready to use basis, most of the time we must modify this to make it a better looking one. Needs more time for resizing, shaping and arranging the fields and labels. It creates Text Boxes of various sizes and shapes depending on the data type and needs more time to shape it up. If you create a Tabular Form using Employee Table from Northwind.mdb sample database, you will know what I am talking about. 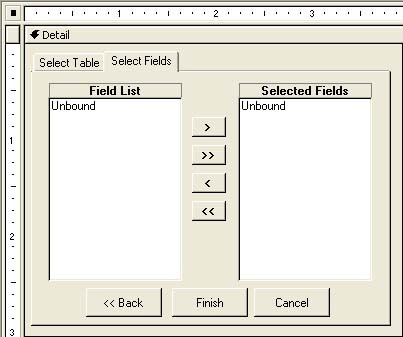 Up to Access2000, when the Table or Query have more fields then all of them cannot be placed on the 22cm width of the Form and ends up in error. Later Versions squeezes the controls to accommodate all the fields on the Form. 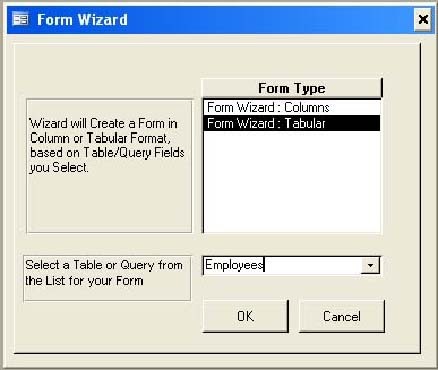 The Form Wizard has a simple design and easy to make, except the VBA Programs. 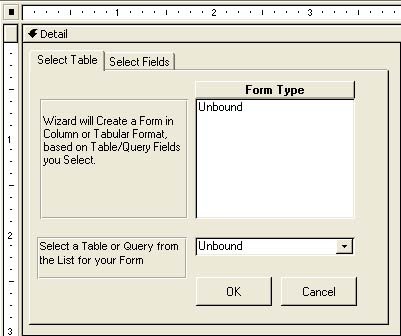 You can download this FormWizard from the bottom of this Post and check the design, Property settings, VBA Routines etc. An image of the FormWizard in running mode is given below. The Wizard can create a simple Form in Column Format or Tabular Format. You can select a Table or Query for the Form from a Combo Box. Insert a Tab Control on the Detail Section of the Form. Select the First Page of the Tab Control and display the Property Sheet (View - -> Properties). Change the Caption Property Value to Select Table. This description now appears on the First Page of the Tab Control. Create a List Box as shown on the design and position its child label on the top and give the Caption value Form Type. Create a Label at the left side of the List Box and enter the Caption Text as shown. Click on the List Box and display the Property Sheet. Row Source : 1;"Form Wizard : Columns";2;"Form Wizard : Tabular"
Create a Label to the left of the Combo Box and change the Caption value as shown. Create a Command Button below and change the Caption to OK. Create a second Command Button to the right and change the Caption to Cancel. Select the second Tab Control and change its Caption property Value to Select Fields. Create a List Box for Field List and a Second List Box for Selected Fields side by side as shown on the above design. Select the second List Box and change the Name Property to SelList and change other Properties to the same Values as given above. Create four small Command Buttons between the List Boxes as shown on the design. Change their Name property Values as cmdRight, cmdRightAll, cmdLeft., cmdLeftAll from first Command Button on the top to the fourth one at the bottom respectively. Change their Caption Property Values with >, >>, < and << symbols as shown. Create three Command Buttons below the List Boxes. Change the Name Property Value of the left Command Button to cmdBack and the Caption Property Value to <. Change the Name Property Value of the Command Button in the middle to cmdForm and the Caption Property Value to Finish. Change the Name Property Value of the right side Command Button to cmdCancel2 and the Caption Property Value to Cancel. Click to the right side of the second page of the Tab Control to select the Tab Control and display the Property Sheet. After setting the last two properties of the Tab Control it disappears and nobody can tell that we have designed the whole Wizard on a Tab Control Object. Save the Form (File - -> Save) with the name FormWizard. One important step left to complete, copying and pasting the complete VBA Routines into the Form Module of the FormWizard. Display the Code Module of the Form (View - ->Code), while the Form is still in design View, Copy the entire Code given below and Paste it into the Code Module of the Form and save the Form. MsgBox Err & ":" & Err.Description, , "cmdNext_Click"
FROM MSysObjects " _& "
MsgBox Err & ": " & Err.Description, , "Form_Load"
MsgBox "Fields Not Selected for the Form"
MsgOK "Fields Not Selected for Form", "FormWizard"
NB: You must ensure that the Name Property Values of all objects are given correctly to avoid Run time errors. 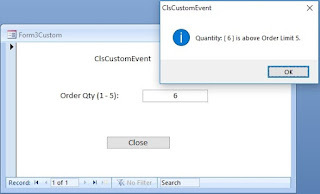 If you find any of the controls is not working as expected check whether the Name Property Value is given correctly and the On Click property is set with the Value [Event Procedure]. The On Click Property Value will automatically insert the [Event Procedure], if the Name of the control is same as it is referenced in the VBA Routines. Open the FormWizard in normal View. Select one of the Form Design type Column or Tabular and select a Table or Query from the Combo Box below and Click OK. The List Box will appear with Field Names in the next step. You can select one or more data fields of your choice and click the button with the > label to move the selected fields to the right side List Box. You can select all the Fields from the List by clicking on the command button with the >> label. If you have second thoughts you can Remove the fields from the selected list the same way you selected from the first List Box, using the < and << labeled Command Buttons. When you are ready to create the Form click on Finish Command Button. The Form will be created and will open in Normal View. You may Save the Form and change to design view for modifications. Hi, this is brilliant. In section, you need to select fields, so these will be displayed on heading columns. I want to know how to change/modify to show records/values, instead of fields. I want to select records, for example, in Employees table, I want to choose one particular employee. How can it be done? Thanks.